Lil’ Inker Designs kick off hop! Let the party start! We are so glad you could join us for our very first blog hop for Lil’ Inker Designs. 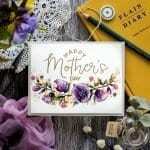 Hopefully you came here from Teresa‘s blog, and if so you are right on track. If not, make sure you start at the beginning over at Laura’s blog because there are terrific prizes for those who complete the hop by commenting on each blog. There are only 12 blogs and you have a week, so relax and enjoy! 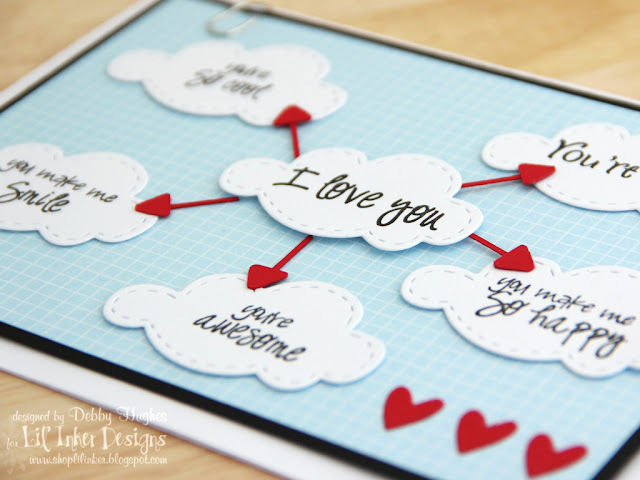 The blog hop today is all about the ‘Rainbows & Clouds‘ dies and coordinating stamps. Just look at those cute sentiments in such a great font and the dies, oh the dies! They cut so clean and the clouds have a great pierced border to them. They are designed so well! When I first looked at these dies I started thinking, not unsuprisingly, about rainbows and clouds! As I thought about the cloud die in particular my mind began to wander to modern terms such as cloud computing and iclouds pushing data from one place to another and of cloud diagrams demonstrating the process. So I cut myself a bunch of the larger cloud to play with and this is the result! 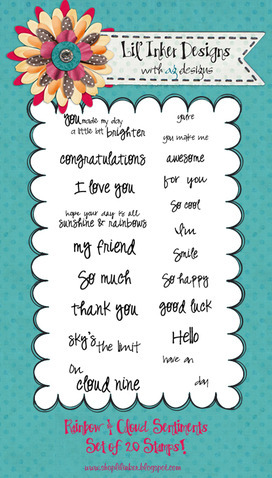 All the sentiments apart from one are from the Rainbow & Clouds stamp set which just shows you a small amount of the possibilities with this set. Now as I had the cloud dies out, I sat there and looked at them and thought about what else they could become. How about tree tops! I seem to have love on the brain LOL! I used the smaller cloud to cut three tree tops, popping the middle one up on dimensionals. I’m so glad you stopped by! 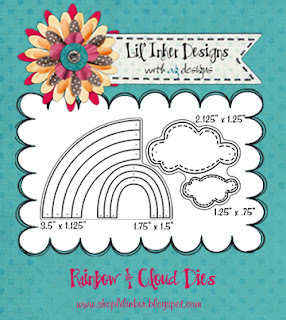 I hope I’ve inspired you to play with our ‘Rainbows & Clouds‘ set. 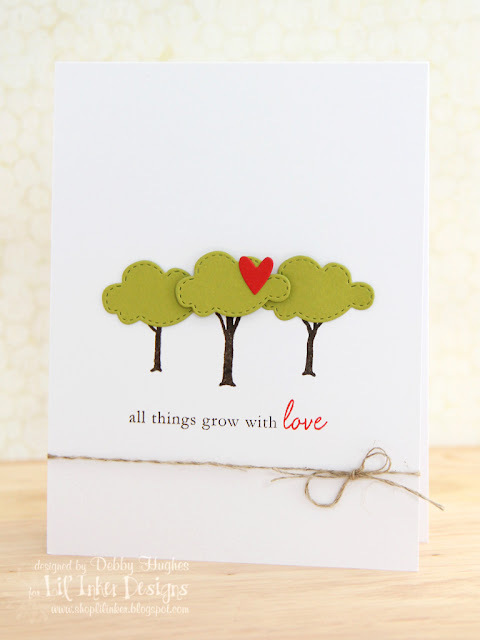 Please make sure you leave a comment on my blog because Lil’ Inker Designs is giving away some pretty terrific prizes! The deadline for commenting is 11:59pm EST, Sunday, August 14th. Your next stop on the hop is Sarah‘s blog. However, if you get lost along the way, here’s a list of all the places to visit. 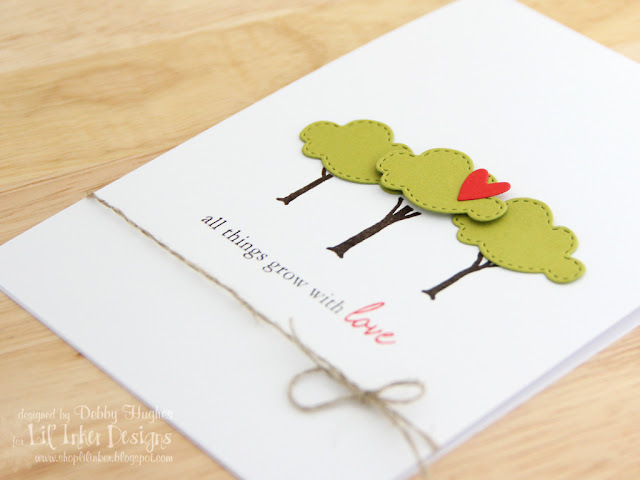 Debby Hughes – you are here now! You have some serious talent, lady. Will be spending some time on this blog today. You are very inspiring. I love your little cloud diagram. It must have come from one inspiring brainstorming session! And I think using the clouds as trees is brilliant! I’ll be thinking about this set differently from now on. These are both just too cute!